It is worth combining a visit to the Hunnenring with a circular walk, for the area around Dollberg has a wide range of other attractions to offer. 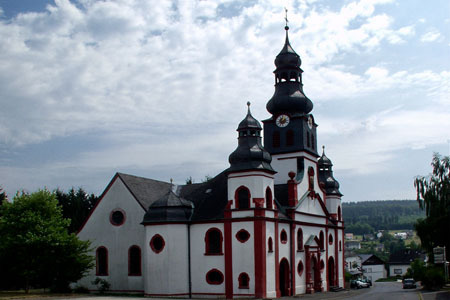 The starting point could be Züsch, a small village at the northeast foot of Dollberg, which has a church worth seeing. From Züsch the European long-distance trail, "Atlantik-Ardennen-Böhmerwald", first leads you to the Züsch mill on the Allbach stream and then to the Celtic ring wall on Dollberg (620m). The return path leads steeply down into the Prims valley, where the Nonnweiler dam has formed the Primstal reservoir, the largest reserve of freshwater and water for industrial use in both the districts of Rheinland-Pfalz and Saarland although it is not suitable for bathing and diving not allowed. It is worth noting that the Prims river does not drain into the Nahe but into the Rhine via the Saar and Mosel Rivers. A dense forest lies alongside the reservoir to the mouth of Allbach stream, which can be followed upstream to Züsch. Just before you reach the village, you encounter the ruins of "Züscher Hammer", a former iron-smelting plant that was shut down 165 years ago. It started up in the second half of the 17th century together with another iron-smelting plant in the neighbouring village of Dampflos and processed the iron ore of the region, particularly the ore mined near Otzenhausen. At the beginning of the 19th century, when the great iron-processing industries started production in the Ruhr Basin and Saarland, the "old" ironworks in Hunsrück became redundant due to the much poorer quality of their iron ore.